AmazonSmile is a simple and automatic way to give back to our local St. Johns County public schools without spending any extra money! You will be offered all the same low prices and selection of products with the added bonus of a percentage of your purchase price going directly to Davidson Cares. Tens of millions of products are eligible for donation through AmazonSmile, so you won’t have any problem finding what you need and giving back! For consistent Amazon users, you might be wondering if this awesome new program works with your current account. The answer is yes; your shopping cart, wedding or baby registry, wish list and other account settings are all the same. Plus, it’s available for Amazon Prime users! Visit http://smile.amazon.com/ch/46-0918130 and start shopping! Once you shop through that link, every eligible purchase you make on AmazonSmile will result in a donation (.5% of the purchase price) to Davidson Cares! 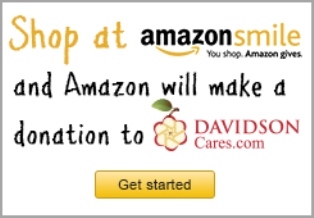 Be sure to bookmark http://smile.amazon.com to choose Davidson Cares as your charity of choice and continue to use this link to access Amazon each time you shop! For more information on AmazonSmile, call Matt Davidson at (904) 940-5000.